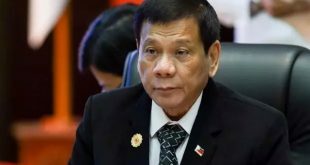 DAVAO, Philippines, May 24, (AFP): Explosive incoming Philippine president Rodrigo Duterte has launched a series of obscenity-filled attacks on the Catholic Church, branding local bishops corrupt “sons of ….” who are to be blamed for the nation’s fastgrowing population. Duterte also warned the Church, which has a centuries-old tradition of influencing Philippine politics, that his landslide election win this month showed he had more power than its leaders and would defy them by dramatically expanding family planning. “Don’t …. 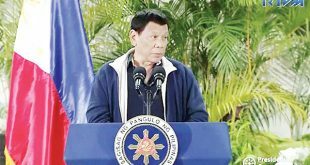 with me,” Duterte told senior church figures who had criticised him, delivering his message via reporters at a press conference in his hometown of Davao on Monday night. He defied conventional political wisdom with his huge win in the presidential elections, after an incendiary campaign that saw his popularity surge on threats to kill tens of thousands of criminals and vulgar tirades against establishment figures. Duterte last year called Pope Francis a “son of a whore” for causing traffic jams when he visited Manila, a bold tactic in a nation where 80 percent of the population is Catholic. Just before the election, the Catholic Bishops Conference of the Philippines released a letter advising Filipinos not to vote for a “morally reprehensible” candidate. 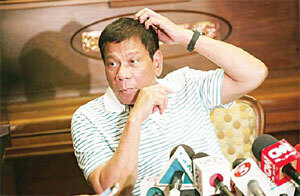 The letter did not name Duterte, but it was widely assumed to have been directed at him. Duterte indeed this week said he was the target. “It is time to be clear between us. You have been castigating me, criticising me,” he said at a press conference on Sunday in his first post-election tirade against Church leaders. Duterte then described Filipino bishops as “sons of ….”, as he accused them of being corrupt hypocrites and vowed to expose their “sins”. Duterte, who admits to serial Viagra-fuelled adultery against his current partner after having his first marriage annulled, also blamed the Church for the nation’s rapid population growth. The Church has opposed the government giving out contraceptives and teaching family planning. While a law was passed in 2012 allowing the government to provide contraceptives, church lobbying helped influence politicians to cut funding for the programme. Duterte vowed to dramatically expand the programme after he takes office on June 30, stating he wanted families to have a maximum of three children. He has four children to two mothers. 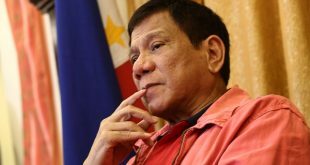 Duterte has also set himself up for a confrontation with the Church on another key front, promising to bring back the death penalty. The Church will not back down against Duterte on such core issues, one of its leaders, retired archbishop Oscar Cruz, said on Tuesday. “We won’t be quiet … the Church will preach what it thinks is right,” Cruz said on DZBB radio. Cruz said the Church leaders would be willing to talk with Duterte. “The only difficulty is one of the parties is automatically antagonistic against the other. How can you have dialogue fairly and squarely with such an ambience,” Cruz said in another interview on ABS-CBN television. The Catholic Church has been a central figure in some of the Philippines’ most tumultuous political events of recent times. The then-Manila archbishop, Cardinal Jaime Sin, was one of the leading figures in the 1986 “People Power” revolution that overthrew dictator Ferdinand Marcos. However the Church has lost power as society has become more secular, and Duterte’s tirades against bishops are likely to get a lot of support, according to Antonio Contreras, a political science professor at De la Salle University in Manila. 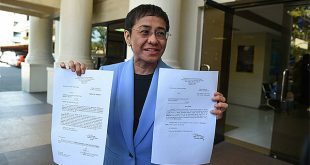 “A lot of ordinary people say it is about time you have to engage (challenge) the Church and its hypocrisy,” Contreras told AFP, adding this was the first time an incoming president had challenged the nation’s religious elite so forcefully.